So… VAR! Well after Englands opening fixture at the FIFA World Cup 2018 we thought it would be best to give you all the full low down on how FIFA plan to use VAR at the World Cup and here’s everything you need to know. Why has VAR been introduced? What decisions will VAR be used for? Video assistant referees can assist match officials’ decision-making in four ‘game-changing’ scenarios. These are: Goals and offences leading up to goals. Penalty decisions and offences leading up to penalty decisions. Direct red card incidents (second yellow cards are not reviewed, bizarrely). Cases of mistaken identity. It has also recently been announced that red cards can be given retrospectively by VAR decision meaning a referee could send off a player even if play has restarted after the incident occurred. Such decisions are likely to be made for the off-the-ball incidents that may be missed by the referees on the pitch and only in the case of serious red card offences. What is the process for a decision to be made through VAR? 1. The ‘game-changing’ incident has occurred. 2. It is reviewed by VARs and subsequent advice is relayed to the referees who will wear a headset. 3. The referee then decides which course of action to take. VARs can only offer advice to referees, they cannot make decisions for themselves and they will communicate via a radio system. If a referee remains in doubt, they can check a monitor of the incident by the touchline. Where will VARs make their decisions? VARs will make their decisions in VORs (honestly we aren’t making this up). VOR stands for ‘video operation room’ and there will be one in Russia, located in the International Broadcast Centre in Moscow. All camera feeds (there are no fewer than 33 broadcast cameras accessible to VARs) from the 12 stadiums will be provided to the VOR via a fibre-optic network. So no, they won’t be watching the games on any dodgy internet streams. Is there just one VAR monitoring the game? No. Similar to the referee out on the pitch who has their own assistants to help out, so too does the VAR. There are three assistants, or AVAR’s, who are there to assist. Each of them have different jobs so as not to create a too-many-cooks type situation. It is to be noted that FIFA have said that all VAR’s and AVAR’s are top FIFA match officials. VAR: The VAR watches the main camera on the upper monitor and checks or reviews incidents on the quad-split monitor. He is responsible for leading the VAR team and communicating with the referee on the field of play. AVAR 1: The person taking this role concentrates on the main camera and keeps the VAR informed about live play if an incident is being checked or reviewed. AVAR 2: The AVAR 2 is an Assistant Referee located at the offside station. He anticipates and checks any potential offside situations to speed up the VAR check and review process. 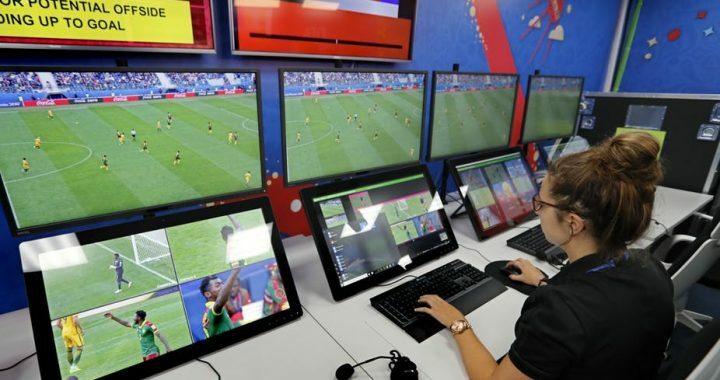 AVAR 3: This role focusses on the TV programme feed, assists the VAR in evaluating incidents and ensures good communication between the VAR and AVAR 2 located at the offside station. So from the information made available from FIFA it would appear that the VAR team will be 3 Referees and 1 Assistant Referee that form the VAR team. Alongside FIFA’s announcement of Match Officials that would attend the World Cup they have also announced 13 Referee’s that will only act as VAR or AVAR at the World Cup, of course this would not be enough for all the games as your aware already for one day of football with 3 games you need 12 so it would mean working everyday or doubling up on games to ensure other officials get a break so this is why some of the 32 Referees that were named will also act as VAR or AVAR depending on their experience with the role back in their own country and also through pre World Cup training.